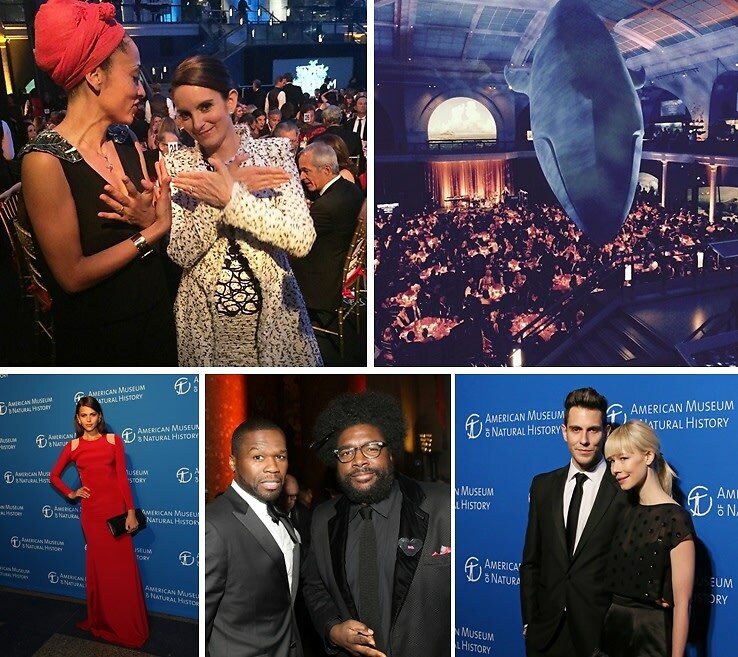 The American Museum of Natural History hosted its 2014 gala last night with some of the biggest names in the entertainment industry and beyond. Guests, including the ever-entertaining Tina Fey, as well as musician-designer duo Gabe Saporta and Erin Fetherston, were among those in attendance. 50 Cent, Zadie Smith, Cameron Diaz, and Naomi Campbell also showed, dressed in their best formal ensembles. The gala also featured a special performance by musical artist Bruno Mars (swoon!). For an inside look at the elegant evening at one of New York City's most famous museums (and a night spent dining under the whale!) be sure to check out our slideshow. Who was there: Guests included Cameron Diaz, Diana Agron, Eddie Redmayne, Catherine Keener, Seth Meyers, Laura Prepon, Benjamin McKenzie, Mike Myers, Darren Aronofsky, Colin Jost, Kyle Mooney, Taran Killam, Kenan Thompson, Cecily Strong, Steve Higgins, Vanessa Bayer, Beck Bennett, Adiy Bryant, Michael Che, Pete Davidson, Leslie Jones, Kate McKinnon, Bobby Moynihan, Jay Pharoah, Sasheer Zamata, Matt Harvey, Claire Bernard, Derek Blasberg, Giovanna Battaglia, Stephen Daldry, Erin Fetherston, Naomi Campbell, Georgia Fowler, Bryant Gumbel, Curtis “50 Cent” Jackson, Steve Kroft, Questlove, Sean MacPherson, John McEnroe and Patty Smyth, Al Roker, Cynthia Rowley, Bee Shaffer, Zadie Smith, Lara Spencer, Lesley Stahl, Jill and Alan Rappaport, Karen and Richard LeFrak, Lewis Bernard, Kitty and Thomas Kempner, Roberto and Allison Mignone, Roger Altman and Jurate Kazickas, Ralph Schlosstein, Virginia Hearst Randt and Dana Randt, Jackie Bezos, Marlene Hess and James Zirin, Anne and Charles Mott, Judy and Archibald Cox, Laura Baudo Sillerman, Connie and Ted Roosevelt, Ann Ziff, and Muffie Potter Aston.